I had the great honor of spending time with Billy Frank Jr.
Every time he spoke, I was inspired and moved by his simple, direct, and passionate voice. He just picked up the microphone and spoke from the heart, saying what needed to be said. He has been my inspiration also when I find myself speaking in public; I draw on Billy Frank to remind me to speak simply, directly, from the heart. 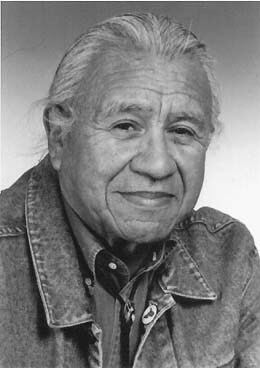 Billy Frank Jr. was a Native American environmental leader and treaty rights activist. Soft spoken with a inner passion, Frank became a charismatic statesman for tribal rights. For many years I attended the Vine Deloria Jr. Symposium at the Northwest Indian College. Billy was a good friend of Vine and Billy would share stories of working with Vine in the battle for native rights. This symposium would attract interesting presenters for all over the country. But when Billy would speak, the room got silent – everybody listened. He would always call to the younger generation to step up and protect their rights. Tribes reserved the right to fish, hunt and gather shellfish in treaties with the U.S. government negotiated in the mid-1850s. But when tribal members tried to exercise those rights off-reservation they were arrested for fishing in violation of state law. Frank was arrested more than 50 times in the Fish Wars of the 1960s and 1970s because of his intense dedication to the treaty fishing rights cause. I would encourage you to do a Google search on this remarkable man and his legacy.